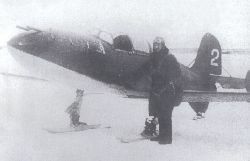 The fifth prototype of the BI, probably photographed during its gliding trials near to the end of the war while fitted with somewhat crude main undercarriage skis. The upper surface black and green camouflage is very evident in this picture, there being a noticeable contrast between the two colours. All the BI prototypes bore individual and very different camouflage patterns, and there is evidence of repainting on some of these aircraft at various times during their lives (Photo: John Batchelor Archive). Significant attempts were made in the Soviet Union during the late 1930’s and on into the 1940’s to create a successful rocket-propelled fighter. This work encompassed the then-developing (but by no means new) technology of rocket propulsion, allied to the pressing needs of the Russian military as the Great Patriotic War gathered pace following the German invasion of the Soviet Union in June 1941. The pioneering work on rocket propulsion that took place during that period had considerable value not just at the time but for the future as well, particularly in later years during the race into space between the Soviet Union and the United States in the 1960’s and on into the 1970’s. 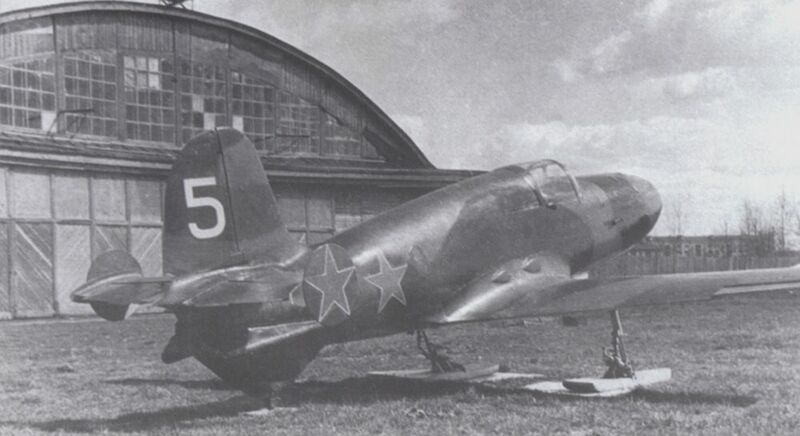 One of the chief creations that arose out of the Soviet Union’s attempts to develop a rocket-powered combat aircraft in the early 1940’s was a small, compact fighter known as the Bereznyak-Isayev BI. This aircraft was a true pioneer, and although it never became operational it extended the boundaries of the evolving science of rocket propulsion and its possible applications. Due in large part to the pressing needs of the military situation that the Soviet Union found itself during 1941 the BI itself had a comparatively short design period, although the roots of its means of propulsion could be traced back much further into the past. Research into liquid-fuel rocket propulsion, as distinct from solid-fuel propellant, had existed in a number of countries prior to World War Two. In Russia, pioneering work had been carried out by a number of scientists and designers, leading to the possibility of liquid-fuel propulsion as a practical (as opposed to theoretical) proposition. During the early 1930’s a body known as the RNII (standing in Russian for the scientific research institute devoted to rocket-engine research) had been formed, bringing together a number of designers and scientists. In addition, several aircraft designers who were to become important players in the Russian rocket-propulsion story were also becoming active in this field at that time. Amongst them was Sergei Korolyov. He was an accomplished glider designer, who had turned to rocket engine research during the 1930’s. Putting the two together, Korolyov employed a glider design with which he had been associated, the SK-9, as a rocket motor test-bed. Known as the RP-318-1 in its rocket-powered form, the SK-9 made a pioneering flight under rocket power in February 1940 having been towed aloft by a Polikarpov R-5 biplane. The engine used for this important and successful flight was an RDA-1-150 rocket motor of some 100 kg (220 lb) thrust, which was a development of the ORM-65 designed by Russian engine pioneers Valentin Glushko and Leonid Dushkin. The ORM-65 was powered by liquid propellant, consisting of a mix of kerosene and nitric acid: the kerosene was the fuel, while the nitric acid acted as the oxidant. A still-frame taken from a film showing the BI No.3 in action. It is now widely accepted that it was this aircraft that crashed in March 1943 during a high-speed flight, killing its test pilot. Significant though the first powered flight of the rocket-powered RP-318-1 had been, it was by no means the first flight of a rocket-powered man-carrying machine. In 1937 a major amount of liquid-fuel rocket-powered test flying had commenced in Germany using at least one specially-converted Heinkel He 112 fighter prototype. Pre-dating that work had been pioneering experimentation in Germany with rocket-powered man-carrying gliders. It is additionally worth noting that the Germans had also designed, built and flown an aircraft specifically for rocket power, by the time of the successful test flight in Russia of the RP-318-1. This German rocket aircraft was the Heinkel He 176 (not to be confused with the turbojet-powered Heinkel He 178), which first flew under rocket power in June 1939. In the Soviet Union, pioneering experiments including the flight-testing with Korolyov’s RP-318-1 glider allowed Soviet designers the chance to regard liquid-fuel rocket propulsion for a number of applications. These had already included for some time the possibility of rocket projectiles and missiles, but now liquid-fuel rocket power had become a potentially viable form of power plant for manned combat aircraft as well. Rocket propulsion for manned aircraft was in fact eventually to be regarded in the Soviet Union in two specific ways. Firstly, rocket power was seen as a secondary means of power, to boost the performance (for example at take-off) of the already-existing conventional power plant of a combat aircraft. But significantly, rocket power was now increasingly to be regarded as a primary means of propulsion for combat aircraft. A number of designs for potential fighters powered by liquid-fuel rocket motors eventually came to be created in the Soviet Union. These included the Tikhonravov 302, which at one stage was envisaged as a mixed power plant straight-winged fighter with a rocket motor in its fuselage and a ramjet beneath each wing in pods similar to the jet-engined Messerschmitt Me 262. 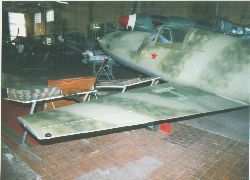 Known also as the Kostikov 302, and sometimes as the I-302, Type 302 and Ko-3, this aircraft did not appear to progress to the stage of making powered flights although it has been claimed to have been towed as a glider. The project was cancelled in 1944. Another Soviet rocket fighter programme was the Polikarpov Malyutka. This was planned as a simple, tricycle undercarriage straight-winged short-range interceptor to defend valuable point targets. Although construction of a prototype was well under way in 1944, all work on the project ceased with the death of Nikolai Polikarpov and the subsequent disbanding of his design bureau. Well-known but nonetheless interesting picture of the first BI, photographed probably in September or early October 1941 when it was engaged in un-powered flight trials as a glider. The left-hand towing attachment can be seen under the forward fuselage, and some form of towing fixture appears to be hanging in this picture from the right-hand towing attachment (Photo: John Batchelor Archive). The failure of the Malyutka and Tikhonravov 302 projects left one star amongst the Soviet Union’s attempts to create a viable rocket-powered fighter for front-line service. This was the Bereznyak-Isayev BI. Development of the BI was in fact directly influenced by the success of the Korolyov RP-318-1 rocket-powered glider. The driving force behind the BI was Aleksandr Bereznyak, who was an aerodynamicist at the VVIA (the Soviet air force’s academy) located at Zhukovsky outside Moscow. Bereznyak was working in 1940 for Professor Viktor Bolkhovitinov, who was a professor of aircraft design and chief of an aircraft design team at the VVIA. One of the designers of the RDA-1-150 rocket motor that had powered the RP-318-1 was Aleksei Isayev, and following the success of the RDA-1-150 he was involved with Dushkin in the creation of a more powerful rocket motor. This eventually emerged as the Dushkin-Isayev D-1A-1100 of 1,100 kg (2,425 lb) thrust at sea level. Such a rocket motor promised sufficient power to allow a small, light fighter aircraft to be designed around it. When Bereznyak became aware of the existence of the D-1A-1100 (it is sometimes claimed that Isayev told him of its creation in a chance conversation), Bereznyak is recorded as having conceived the idea of designing a fighter aircraft capable of point defence utilising the D-1A-1100 power plant. Bereznyak later discussed his ideas with Professor Bolkhovitinov, who must have been positively impressed because he duly made efforts for the proposals to gain official approval. The weight behind Bolkhovitinov’s suggestions was obviously well-received in the right circles, particularly in the GUAP (the chief directorate of the Soviet Union’s aircraft industry) which can be roughly seen as the Russian equivalent of the relevant departments within Britain’s then-contemporary Air Ministry. Such was the way in which the Russian aircraft industry was run under the dictatorship of the time that official favour came with the price for those concerned of the parallel expectation that success would be achieved to the highest – and fastest – degree. At this point Russian sources disagree as to when there was actually official go-ahead for the creation of a rocket-powered fighter based on Bereznyak’s ideas. It has been claimed that this took place in the spring of 1941. On the other hand, the timetable referred to in the book ‘Soviet X-Planes’ by Gunston and Gordon, points to a project go-ahead following a detailed letter of proposal by Bolkhovitinov in July 1941. 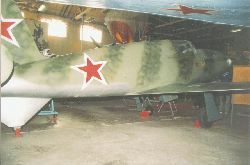 It has also been claimed that the GUAP’s green light to Bolkhovitinov came hand-in-hand with the drawing-up of an official requirement for a rocket-powered fighter to which other aircraft designers were invited to respond – and that this caused Polikarpov (with the Malyutka) and Tikhonravov (with the 302) also to create rocket fighter designs. Apparently taken from a film showing the BI, this is claimed to be test pilot Grigory Bakhchivandzhi standing beside the BI No.2. Note the bracing to the tailplane on this aircraft, indicating that it flew with the rocket motor installed and running. The small size of the BI is also evident in this view. One point that most sources agree on was the pressing need built into the official go-ahead for things to happen rapidly. The initial requirement seems to have been for five prototypes of the BI, with the time to the first flight of the initial aircraft being only 35 days! This was highly ambitious for a project that aimed to create the world’s first-ever front-line rocket-powered combat aircraft. It appears that a design team at Bolkhovitinov’s offices worked for several weeks around the clock on the rapid design of the new aircraft. Due to their specific inputs regarding the necessary aerodynamics and power plant, Bereznyak and Isayev came to be specifically associated in name with the new aircraft. The designation of BI was therefore forever after associated with the project. 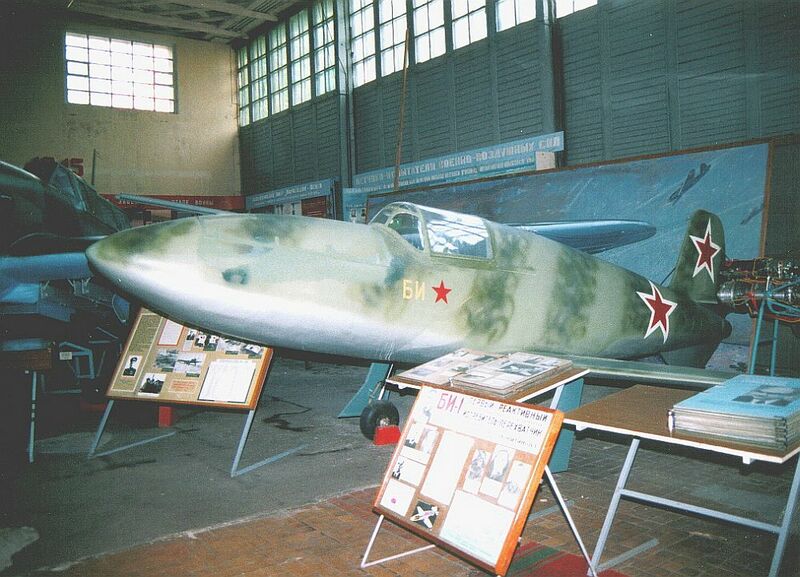 Wind-tunnel work, presumably using models of the planned fighter, was performed at CAHI (the forerunner of TsAGI, the Soviet Union’s central aerodynamics institute). The result of this frantic work was a small, mainly wood construction aircraft fitted with the revolutionary Dushkin-Isayev power plant. The new fighter was envisaged as a point defence fighter, its expected short endurance limiting it to brief defensive combat missions. The first BI was complete by early September 1941, and its first flight was made on 10 September 1941. The test pilot was Boris Kudrin, and the BI was towed by a Petlyakov Pe-2. The flight was unpowered, but its success seemed to suggest that the BI had considerable potential. At that point the general war situation took a hand in events. The German invasion of the Soviet Union in June 1941 had been followed by massive advances by German forces. This had resulted in the start of hasty evacuations of Soviet factories and design teams to the east in order to place considerable distance between them and the invading Germans. The BI project also became caught up in this situation, and from mid-October 1941 the BI was moved east to the outskirts of the city of Sverdlovsk. The new location for the BI and its workforce appears to have been a part-completed factory, hardly the ideal location for the continuation of such a ground-breaking project. The famous Monino aviation museum outside Moscow has on display this BI look-alike reconstruction. Best described as a replica using – it is believed – some original BI components, the aircraft is described on an explanation board beside it as a ‘BI-1’. The colour scheme is pure fantasy and seems to have been the invention of a creative paint-shop technician. I took these photographs during a visit to the museum in 2001 (Photos: Malcolm V. Lowe). The first D-1A rocket motor to be installed into a BI was in place early in 1942, further development work having been rapidly carried out by Isayev’s team throughout the latter months of 1941. The first successful ground running of a D-1A inside a BI prototype was made in April 1942. Test pilot Boris Kudrin had, however, been injured due to an explosion of a D-1A. This left flight testing of the BI primarily in the hands of former Soviet air force fighter pilot Grigory Bakhchivandzhi. On 15 May 1942, Bakhchivandzhi made the first powered flight of a BI with the D-1A motor providing all the power. It seems, however, that this official first flight might have been pre-dated by an unscheduled lift-off during taxiing trials prior to 15 May. In any case this first official flight was a huge achievement for the Soviet Union. It put the BI firmly into contemporary status with the German Messerschmitt Me 163 Komet rocket fighter. The Me 163 had first flown under rocket power during 1941, but delays with its power plant meant that it would not enter front-line Luftwaffe service for some time to come. At this stage, the Russians with the BI had the chance to get their rocket fighter into operational service first, before the Germans. But it was never to be. In the months following Bakhchivandzhi’s first powered flight in a BI, various towed and glider-style flight tests appears to have been carried out by several of the BI prototypes, but powered flight testing seems to have been kept to a minimum. A reason given for this has been that the rocket fuel used by the D-1A rocket motor was proving to be a highly difficult and dangerous quantity to deal with. The D-1A was fuelled with a mix of kerosene and nitric acid: the nitric acid, as with the RDA-1-150 rocket motor, acted as the oxidant. It is usually noted that this nitric acid was RFNA (red fuming nitric acid), which spelt danger for those trying to handle it, and also led to corrosion in fuel lines within the BI itself. In similar fashion to the experiences of the Germans with the Me 163 and its own highly dangerous fuel, the Russians were discovering that rocket fuel was hazardous to those using it and to the aircraft that it was meant to power. Most historians now agree that powered flying with the BI resumed in early 1943. This flight-testing proved that the BI had a considerable turn of speed and acceleration. One performance figure has the BI climbing to 3,000 metres (9,843 ft) in 30 seconds, and other impressive readings are also claimed to have been made. Less impressive however, was the aircraft’s short endurance, the BI’s onboard fuel tanks giving it only a few minutes duration. This, again, was a problem that the Germans experienced with the Me 163. The BI’s maximum design speed was put at a rather optimistic 900 km/h (approximately 560 mph). On 27 March 1943 Grigory Bakhchivandzhi took one of the BI prototypes up for the flight test programme’s seventh powered flight. 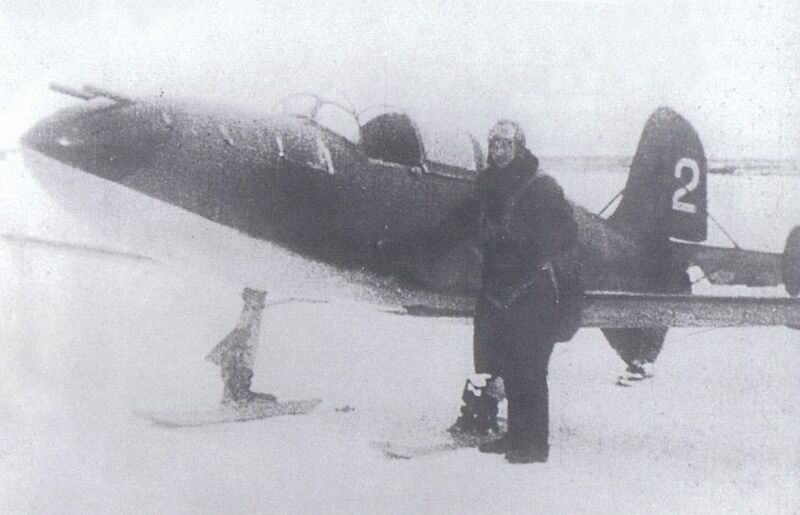 Although it has been claimed in the past that Bakhchivandzhi was piloting the BI No.2 on that day, most historians now agree that it was actually the third prototype in which Bakhchivandzhi took to the air on 27 March. Bakhchivandzhi’s brief for the seventh powered flight seems to have aimed at extending the BI’s flight envelope by examining straight-line speed at low to medium altitude. All initially went well as Bakhchivandzhi opened the throttle at a height of approximately 2,000 metres (6,562 ft), and the little BI hurtled along at some 800 km/h (497 mph). Suddenly, tragically, the BI pitched nose down and went out of control. It dived straight into the ground, killing Bakhchivandzhi. This was a terrible moment for all who observed the crash, and it effectively spelt the end of the possibility of getting the BI into front-line service. Wind-tunnel tests later revealed severe aerodynamic problems relating to the BI’s stability at high speed. The problems were serious enough to rule out tinkering with the design of the BI, as a major re-design appeared to be needed. This, coupled with the chronically short endurance of the D-1A rocket motor, sealed the fate of the BI as a potential production aircraft. Indeed, in general terms the future for manned combat aircraft lay not with rocket power, but with the jet engine which was of course also being developed in a number of countries at that time. Nevertheless, a handful of BI prototypes had been built, and some of these continued testing the BI concept and related equipment and powerplant options, as well as other research programmes. The sixth prototype (and also possibly the seventh machine) was involved in trials of wing-tip mounted ramjet installations. These were tried out in CAHI (TsAGI) wind-tunnel tests on the BI No.6 (sometimes called the BI No.6/PVRD when ramjet-equipped), and would have involved the installation of Merkulov DM-4 ramjets. It is not clear if these were actually fired for real in flight (some published sources claim that they were). Available photographs of the BI No.6 in a wind-tunnel appear to suggest mock-up rather than genuine installations, but at least one source claims that the ramjet motors themselves were actually fitted and test run on the ground while installed on the sixth prototype. Other tests are claimed to have included research work on armoured and pressurised cockpits. It also appears that a later model Dushkin-Isayev rocket motor was tried out in at least one BI prototype, with separate chambers within the motor for cruise and take-off/combat power, in order to try and increase the BI’s very short flight endurance. The exact number of BI prototypes that were completed is another mystery surrounding the whole BI project. Even recently-published Russian sources are not in agreement as to whether there were six, seven or eight prototypes. However, the article by Mikhael Maslov in ‘Polygon’ magazine, 3/2000, points to seven and this seems to be the most reasonable possibility. What does appear to be beyond dispute is that a construction run had commenced of production BI aircraft, these seemingly designated BI-1. 50 examples are claimed to have been commenced, with the first of these nearing completion at the time that official interest started to decrease in the whole programme. These part-completed airframes were later scrapped, together eventually with the surviving BI prototypes. Some of the prototype aircraft must have been badly damaged by acid corrosion, which no doubt hastened their fate. Today a single BI exists, on display at the Russian aviation (air force) museum at Monino outside Moscow. The machine on display is captioned ‘BI-1’, but it is in reality a reconstruction/replica, which contains some original BI parts. Careful examination reveals that it is a strange hybrid, with features of the early and later prototypes built into the same aircraft. In terms of construction, the BI was a very small, light-weight fighter. In fact the original two prototypes appear to have been fractionally smaller compared to the remaining prototypes if at least one source is to be believed. The dimensions quoted by Mikhael Maslov for the fifth, sixth and seventh prototypes include a length of 6.940 metres (22.77 ft), and a wingspan of 6.615 metres (21.7 ft) (Gunston and Gordon in ‘Soviet X-Planes’ give almost identical measurements). Construction was mainly of wood (although at least one source states metal! ), with the fuselage containing tanks and associated fuel lines for the kerosene and nitric acid that powered the D-1A rocket motor. The motor itself was in the rear fuselage. The ailerons, rudder and the moving sections of the elevators were fabric covered. Distinctive circular endplate fins were added to the ends of the elevators. Bracing was attached to the tailplane surfaces when powered flights were undertaken. Some but not all of the prototypes were armed, with two 20 mm ShVAK cannons being mounted in the forward fuselage ahead of the cockpit. The take-off weight fully loaded of the later prototypes was a mere 1,683 kg (3,710 lb). A number of the prototypes were fitted for at least some of the time with skis rather than a wheeled undercarriage. The skis installed on the fifth prototype had the appearance of being much cruder than those fitted to at least one of the earlier prototypes, also with a different attachment. The fifth prototype also operated for a time on wheels, and had a different ventral rear fuselage fairing for the rear undercarriage member. There were many detail differences between the prototypes that are too numerous to list here. The fifth aircraft in particular was something of an anomaly, with odd attachments beneath its fuselage that have received various descriptions including reference to a ‘ski simulator’. This aircraft (and possibly also the sixth prototype) was engaged during the spring of 1945 in various unpowered trials, for which it was towed aloft by a Russian-operated North American B-25J Mitchell. During these flights it carried what appears to be a rail beneath its fuselage presumably for the towing attachment, with strengthening panels on either side of this centreline rail. The BI eventually never fulfilled its initial potential, but what became of the main players in the BI programme? Test pilot Grigory Bakhchivandzhi who died in the BI crash in March 1943 was posthumously awarded the Soviet Union’s major honour of Hero of the Soviet Union. This decoration, however, was not made until 30 years after his death, in 1973. Bereznyak, Isayev and Korolyov all became important personalities in the massive Soviet rocketry programme that developed from the mid-1940’s onwards. In that sense the BI project was a pioneer of the great successes that were made with the Soviet space programme in the following decades – a legacy that persists to this day. The BI project was the catalyst that brought some of the important architects of the Soviet space programme together on a constructive basis for the first time. In that sense the little BI fighter has a positive legacy out of all proportion to the aircraft itself and its limited success at the time of its existence. In this feature I have used spellings of Russian names and bodies which are generally recognised in the ‘West’, but it is acknowledged that other possible spellings exist and are often used. One of the BI’s name-givers, for example, sometimes has his name spelt Isaev (rather than the Isayev that I have used here). I have also employed designations for the BI prototypes that are generally accepted in most published sources (e.g. BI No.5 or BI fifth prototype, rather than BI-5), but again it is acknowledged that other forms of presentation are sometimes used. Particular thanks to Erik Pilawskii and Yefim Gordon for their help and advice, and to the folks at Classic Publications. Thanks also to my dear friend Miroslav Khol for his assistance with translations of Russian published works and documentation, and to Derek Foley and Pavel Jicha for their help with published sources from the past. As related elsewhere in the text, the most important published sources regarding the BI are the ones that have been published recently, especially those with Russian input. Definitely recommended, but hard to find, is the ‘Polygon’ magazine, 3/2000, containing Mikhael Maslov’s excellent 15-page Russian language article on the BI. The book ‘Soviet X-Planes’ by Bill Gunston and Yefim Gordon (2nd edition, published by Midland Publications in 2000) is a very useful source, not just on the BI but on many other of the Soviet Union’s projects and pioneers. Similarly the book entitled ‘Soviet Combat Aircraft of the Second World War, Volume 1: Single-Engined Fighters’ by Yefim Gordon and Dmitri Khazanov (Midland Publishing, 1998) is also recommended. The recent book by Erik Pilawskii titled ‘Soviet Air Force Fighter Colours 1941–1945’ (Classic Publications, 2003) is similarly recommended. An early but interesting article on the BI called ‘The Devil’s Broomstick’ was published in ‘Air Enthusiast’ magazine, December 1973.